When using a green screen, you’re essentially isolating a single color. BIGVU software will make that value transparent and replace the background with a video loop or image. Green screens are typically used as the color is distinct and unlikely to clash with other colors you're wearing. 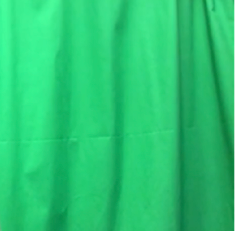 Green screens aren’t expensive, a large sheet of bright green paper or fabric would work. Most important is lighting. If you don’t get your lighting right, it simply won’t work. Shades & shadows should be avoided. They add different colors to the background. Ensure you light your green screen evenly. 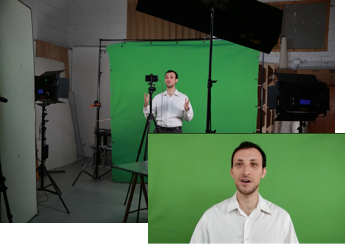 Use soft lighting for your green screen ( see example). Be careful with your own shadow on the green background. Ensure there’s enough distance between you and your green screen so you don’t cast shadows onto it.